'By Invitation' is a new weekly post which will showcase exciting events and exhibitions around the country. 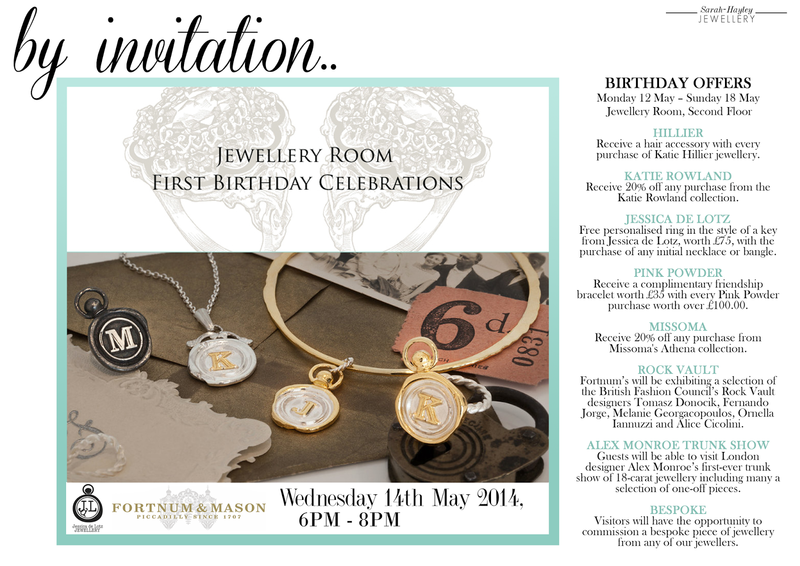 Next week celebrates the first birthday of the Fortnum and Mason Jewellery Room. Located on the second floor, of what is my second home, the Jewellery Room houses some of the best names in the business. Regular readers will know all about my love for jewellery designed and created by my friend, Jessica de Lotz. One of my goals in life is to become a walking JdL Jewellery look book, as every piece within Jessica's extensive collection resonates with me. I am always looking to extend my collection and I can't wait to show you a new, extra special piece, I have commissioned coming soon! JdL Jewellery is one of many brands celebrating the first birthday of the Jewellery Room with a special offer. Take a look above to see the exciting offers available in the Jewellery Room from next from Monday.